This is actually a guest post by Duc himself who very rarely participates in actively cooking or making food and even more rarely in writing. Photographing the food is more his style. However, he somehow fell into an obsession over making the "perfect" beef jerky for our taste preferences and wanted to contribute. I was all for that, and hey, anything that gets him cooking is good enough for me. I love that he's getting into this all AND has some thoughts to share below so read on! I'm an impulsive snacker, and I'll grab whatever is nearby that seems like it would satisfy my random cravings. With all the health craze going on, I figure I should have more control of the quality of snacks I have available. 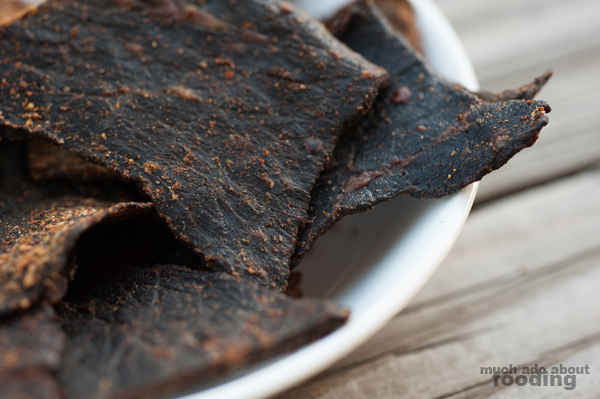 Beef jerky sounded like the best option: it's manly, simple, and doesn't require hard-to-find ingredients. Perfect for a beginner like me! 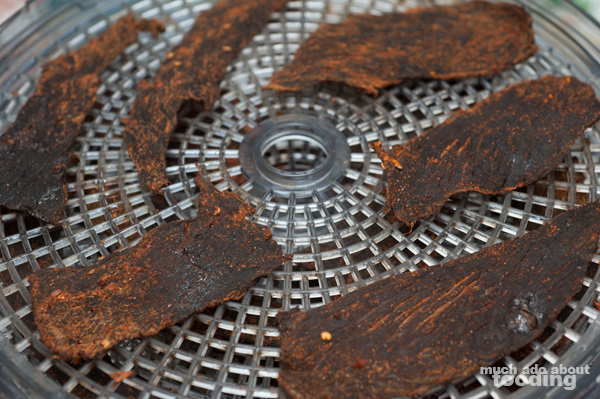 Thanks to the Google gods, I have combined and adapted my own recipe for beef jerky. Credit goes to Food Wishes for inspiring the base of this recipe. It has a short heat kick to it and is beefy enough to satisfy that meaty, salty craving. And it's great for gifting! It also is much more cost effective to make your own than to buy. Grocery stores have jerky for nearly $2 per ounce (Costco has the best pricing at $1/oz)! So let's get started, I'll break this post into commentary from my point of view. Basic steps are to marinate for five hours or more and then dehydrate for five hours or until your desired texture is reached. For meat choice, my top picks would be flank (not flap), brisket, or top round/eye round. My first run was with flap meat which is not an optimal choice because it is fatty; slicing it was also difficult for a first timer. I had to trim off all the fat and slice by hand. Not fun. Save yourself the time and effort by choosing one of the three meats I listed. Reason why is those meats are already pretty lean. 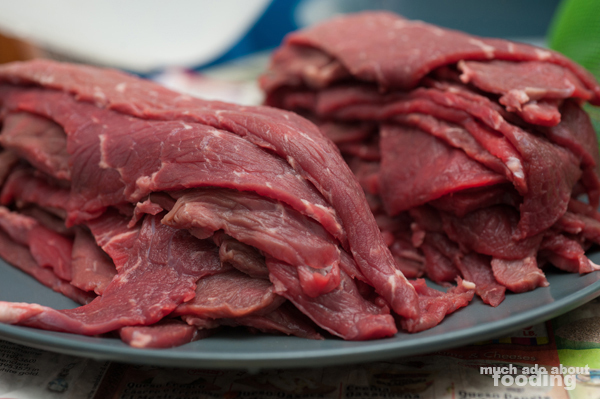 Fat in the meat increases the chance of spoiling and making your batch rancid during the marinating and dehydration stage. It retains moisture and encourages bacterial growth. If you decide to trim and slice yourself, try to get as much fat off as possible! It's best to have your butcher/supplier use their slicer for you so the pieces are consistent. I've found that 1/8" thick cuts WITH the grain work best. 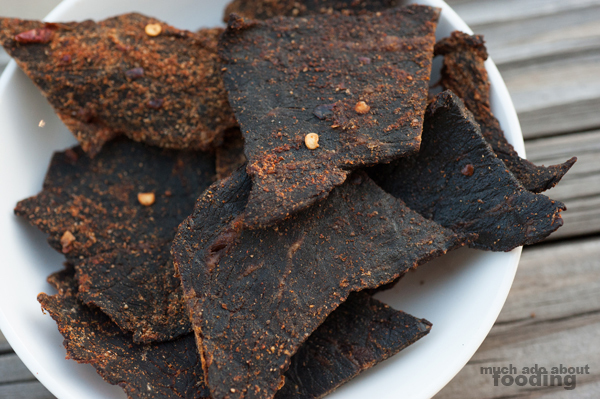 Thinner cuts result in crispy jerky like chips and cuts against the grain make the jerky brittle. Slices with the grain makes chewier, less brittle pieces. Where I live, flank and brisket in small weights (2-4 lbs) was surprisingly difficult to find and even finding an actual butcher was even harder. Chef John from Food Wishes suggested top round/eye round, and that was convenient for my area. The nearby Fresh Choice market occasionally has top round for 3.99/lb already sliced with the grain and at 1/8" thickness. I just had to divide them into strips to fit into my dehydrator trays. This recipe is for 2 pounds of meat but you can scale it up if you have the space on your dehydrator. For the marinade, I chose to go with a base style but eventually want to experiment with sweeter recipes or even Sriracha-based marinades. I used a large mixing bowl but some people have used Ziplock bags or Tupperware. Use whatever you have that allows you to layer all of the beef slices in a way where they all get exposed to the marinade on all sides. I'm a fan of smoked paprika so I used that instead of liquid smoke, which is the popular choice for that smoky flavor. Some people suggest using honey as your sweetener but I prefer dark brown sugar because it dissolves better. You could marinade for three hours all the way up to 24 hours. It's up to you on how beefy or how marinade-y you want it to taste. I usually do two batches - one at 5 hours and another at 12 hours. 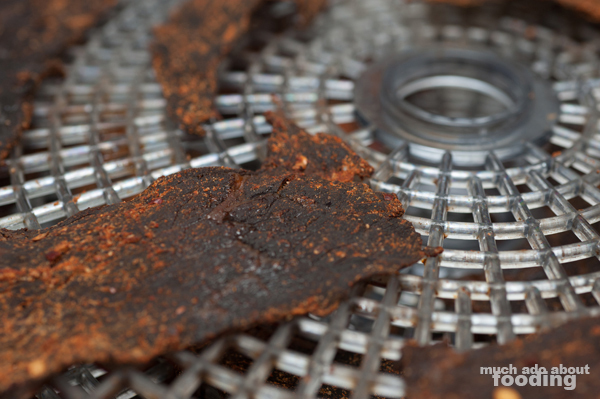 The 5 hour batch gives a beefier jerky while the 12 hours batch has a spicier, saltier taste. Once it has marinaded as long as you'd like, pat each slice down a bit just so it's not dripping wet (so it doesn't ruin your dehydrator). Try to tetris all the slices on the trays without having them touch each other and dehydrate until desired hardness/softness. I did two batches: 5 hours and 12 hours. The 5 hour batch had a chewier feel while the 12 hour batch was crispier. You could also dehydrate with a convection oven (plenty of guides online) but our oven was in use for other stuff, and we had a simple dehydrator available. Mine only had an on/off switch so you don't really need anything fancy like a digital timer or temperature gauge. Storage: Remember that these are homemade so they don't have any preservatives like store brands do. You could still store them for a few months in an airtight container though. I like to cut them into snack size squares with kitchen shears and distribute in Ziplock bags. Lessons learned: Choice of meat is important. Ask the butcher to cut your meat. Try low sodium soy sauce for less saltiness. 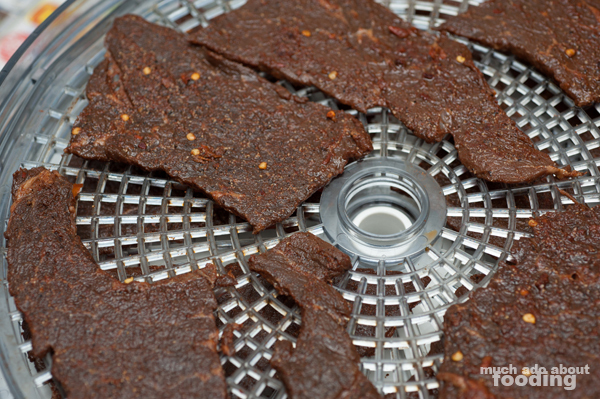 Purchase a bigger dehydrator for more beef jerky yield. Most Asian supermarkets have the powder ingredients for cheap (onion, garlic, chili flakes, etc). Thanks for reading! I'll continue to add to this as I keep experimenting.